Aruba Networks(s arun) is already building a good deal of the world’s enterprise Wi-Fi networks, pumping wireless signals to malls, conference centers and hotels around the globe. Now it has another use for those networks beyond mere connectivity: it can pinpoint a smartphone’s location within those locations’ maze-like corridors. Aruba has acquired Meridian Apps, a Portland, Ore.,-based startup that uses Wi-Fi triangulation to determine location indoors where GPS signals can’t penetrate. (The terms of the deal weren’t disclosed.) Meridian is one of many companies using Wi-Fi signals to gain its bearings, but Meridian, like its competitor Wifarer, also builds apps for businesses that want location-awareness to be key part of their mobile offering. Meridian has designed museum guide apps for the Art Institute of Chicago and the American Museum of Natural History. 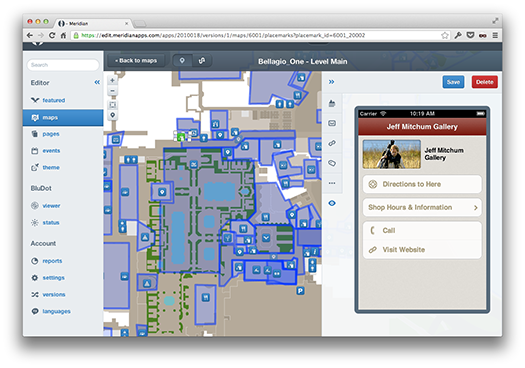 It’s built department locator apps for Macy’s and incorporated casino floor plans into the Bellagio’s mobile app. While this kind of kind of technology can be used to bring the usual bevy of location-based services to building interiors, it has the potential of making those services much more granular. For instance, many of the museum apps developed by Meridian and Wifarer are able to determine not just what room you’re in, but what exhibit you’re actually looking at — the app can immediate populate your smartphone screen with details about the wooly mammoth or Van Gogh painting you’re admiring. This kind of hyper-local content is attracting the interest of the big mobile services players, including Apple(s aapl) and Google(s goog). Aruba’s particular interest in Meridian probably has something to do with the fact that its technology is largely infrastructure-dependent. As Meridian CTO Nick Farina explained in his blog, even though smartphones have the ability to sniff out their own locations by measuring Wi-Fi signals, Meridian’s technology relies on access points to make those measurements, thus sparing the phone’s battery and allowing it to work on more restricted devices like the iPhone. Aruba is the No. 2 enterprise WLAN supplier in the world, supplying networks for every manner of hospital, corporate campus, convention center or mall. You can imagine that many of those customers would be very interested in buying not just a network from Aruba, but also a means to use that network to provide location-aware content and services to their employees and customers.